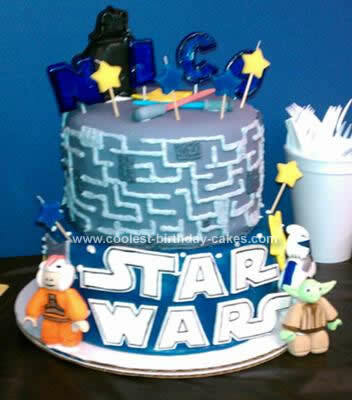 I made all the figures on this Homemade Lego Star Wars Cake Design out of gumpaste (my first experience with it). The colors weren’t as bright as I wanted them to be so after they dried a day I painted them with a mixture of gel food coloring and clear vanilla extract…worked like a charm. The STAR WARS is gumpaste and so are the stars, I also painted them with the same mixure. I covered the cakes in MM fondant. It was a big hit at the party.